All Vertical Cabinets come standard with Roller Bottoms for easy drum removal. Vertical cabinets have ball bearing rollers for easy placing and removal of 55 gallon drums. Complete with a shelf for storing 5 gallon safety cans. Choose from manual closing doors or self-closing doors that feature a fusible link which melts at 165Â°F and allows the door to close automatically. 3-point self-latching doors on all models. 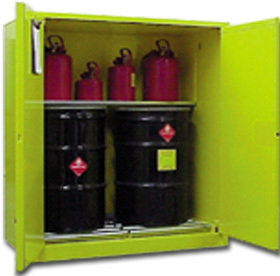 Cabinets meet OSHA and NFPA Code 30 regulations. FM approved. FOB Shipping Point. Drum Roller Bottom included in the Price. Product No. Drums Cans No. Shelves Size H x W x D Wt. (lbs.) Price Ea.